This artist's impression depicts the ESA Herschel space telescope against the Rosette molecular cloud. The powerfulHerschel space telescope has captured an image of a stellar nursery so shroudedby dust that no infrared telescope has been able to see it until now. The new stellarnursery photo is among the first science results from Herschel after theobservatory's launch in May 2009 by the European Space Agency (ESA).Highlights from these results were published in 152 papers devoted to Herschelscience in a new issue of the journal Astronomy & Astrophysics. The cloudfull of babystars lies around 1,000 light-years from Earth in the constellation Aquila(the Eagle). The Herschel pictures ? taken in infrared light ? reveal twoshining regions where big newborn stars are causing surrounding hydrogen gas toglow. At 65 light-years across, the cloud was so dusty that until now, it hadappeared only as a wall. 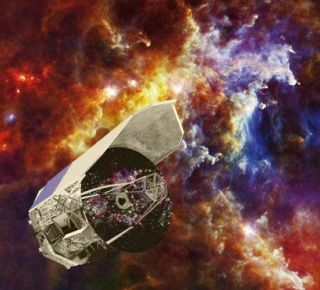 It tookHerschel - the world's mostpowerful infrared telescope ? to peer through this haze. "Herschelhas discovered hundreds of stars forming in the Aquila molecular cloud, and inother areas, Herschel has discovered thousands of infrared galaxies in justhours of observing," Herschel principal investigator G?ran Pilbratt told SPACE.com. Observingstar-forming regions like this is a primary goal of the Herscheltelescope, ESA scientists said in a statement. And it is just one of themany mysteries researchers hope to probe with the telescope's powerful infraredeyes, the scientists added. "Herschelhas made a spectral scan of the Orion nebula with about 100,000 spectralfeatures, you could go on and on, and still this is just the tip of the icebergof what is coming," Pilbratt said. Herschel candetect infrared and submillimeter radiation (light of wavelengths longer thanoptical light) at unprecedented resolution largely because of its 11.5-foot (3.5-meter)diameter mirror, which is big enough to capture longer wavelengths. Theuntapped ubiquity of infrared light in the cosmos means this capacity willimpact our view of nearly the entire universe, researchers said. "Mostof the energy in the universe is infrared," researcher Stefano Berta atthe Max Planck Institute for Extraterrestrial Physics in Germany said in aninterview. "This is why [infrared wavelengths] are so important." Hershel willcontinue observing until it runs out of super-cold helium ? used to cool itselectronics ? which was projected to last 3 1/2 - four years from its 2009 launch,Pilbratt said. Time on thetelescope is shared by the world's community of astronomers, who must submitproposals to vie for limited slots. The actual observations are conducted byESA science and mission operation teams, who follow the design of the selected scientist. ?